Doesn’t your office deserve to be treated to a free lunch for all the hard work y’all knock out every day? I-92 and Shane’s Rib Shack are standing by to give you that well deserved recognition and to treat the whole office bunch to lunch! The way it works, submit the form below to let us know that you’re listening to I-92 at work, you rock and you deserve a free lunch! Well, not just lunch for you, we’ll bring enough to feed up to 10. What’s the lunch? Get ready for barbecue awesomeness from Shane’s Rib Shack! Everyone will get an individual lunch with pulled pork, a pair of sides and lots of Shane’s Sweet Tea! Best of all, I-92’s Greg Thomas will bring right to your desk! A winner is announced each Tuesday afternoon. Lunch is delivered on Thursday. If you haven’t heard about Shane’s Rib Shack, they’re located on Atlanta Highway in Montgomery. Check out their menu, click here. 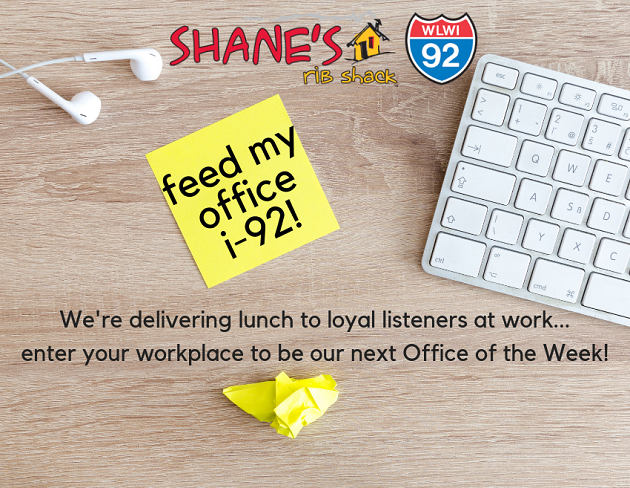 Enter your workplace to win Shane's Rib Shack lunch for up to 10, delivered to your desk by I-92 WLWI! The best number to reach you, if your office is picked a winner! Any special reason why you should win?